Slashed .270/.360/.450 as 17-year-old in Appy League. The Blue Jays traded for international-bonus slots and were able to avoid completely blowing out their bonus pool to sign Guerrero in 2015, instead spending in a range that only benched them from big international spending for one year instead of two. While most 17-year-old international signees spend their first pro season in the Dominican, Guerrero was advanced enough to come stateside. Not only that, but after spending time in extended spring training (and often hanging around and attentively watching Jays’ Florida State League games at night in April and May), Guerrero skipped the GCL and was sent to the Appalachian League, where he was dominant. I’ve spoken with several sources (both with Toronto and without) who think Guerrero will be in the big leagues before he turns 21. He has elite bat speed and power potential, with surprising bat control for such a high-effort swing. His approach at the plate is, predictably, epicurean. But embedded deep within his genealogy is an ability to make this approach viable, and even when Guerrero is poking at balls just a few inches above the dirt that appear totally unhittable, his strength/bat speed is so good that the ball still jumps off his bat and into the gaps. It looks like he’s going to hit, hit for power, and walk quite a bit, too. There’s 30-homer potential here. Guerrero worked out as an outfielder as an amateur but moved to third base after he signed. His thick build at this age indicates a likely move to first base at some point. That said, he’s improved his arm strength (once a question mark, now a 55 or 60) and might stay at third base for a little while, perhaps following a similar defensive path as Miguel Cabrera (though Vlad is already bigger than Cabrera was at age 20-23) or Edwin Encarnacion. Nobody seems to care where he plays, everyone thinks he’s going to hit enough to play anywhere and be a middle-of-the-order force. Produced .142 ISO, 13% walk rate, 18-for-24 stolen-base record in 2016. 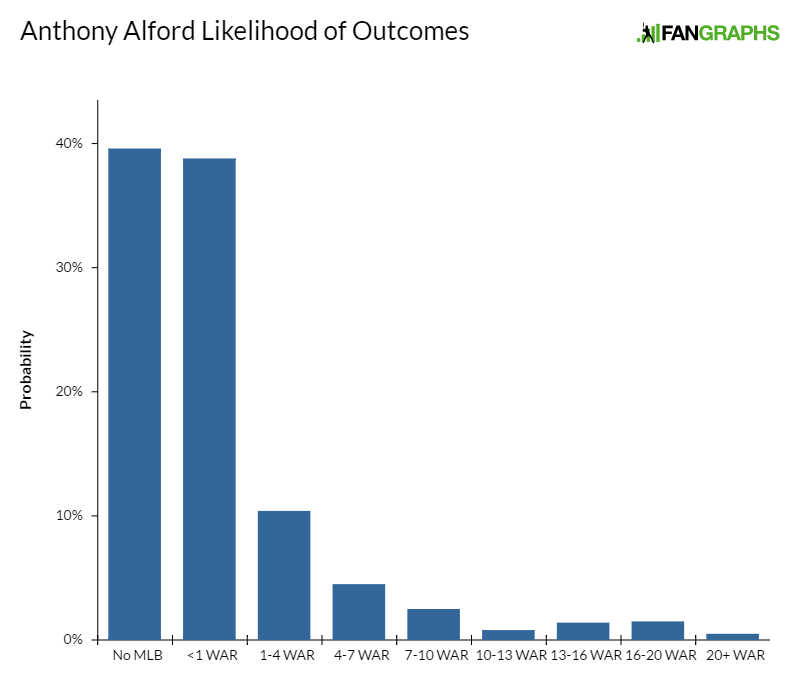 Alford played 25 combined games from 2012 through 2014 because of football and then missed time in 2016 because of a concussion and knee injury, so his pro reps have been extremely limited. Because of this, he’s raw for his age, both in the field and with the bat. But he has plus raw power, is a plus-plus runner, and still has lots of baseball-skill projection remaining because (a) he hasn’t really played all that much baseball and (b) the early-career strides that Alford has already made — and which enabled him to compete against fairly advanced High-A and Fall League pitching — are impressive. I think there’s always going to be some swing and miss here, but the power on contact and favorable defensive profile in center field might allow him to be an impact regular despite it. He’s a potential 20/20 center fielder. Recorded 32% strikeout rate in 10 starts at High-A. As a high schooler in Florida, Reid-Foley was a fairly typical prep pitching prospect. He had big arm strength, up to 97 with the fastball, and had a promising but inconsistent slider and below-average command. He also had a poor changeup and curveball, the latter of which has been added and subtracted from Reid-Foley’s repertoire at various times as it messed with his slider’s effectiveness. He was drafted 49th overall and signed for $1.1 million. In the two full years Reid-Foley has been in pro ball, he has already shown an ability to make several adjustments while progressing fairly quickly through the minors. Because of his command and a somewhat violent delivery, some scouts considered him a future reliever, but he improved his delivery’s consistency last year and now has a better chance to start. That aforementioned curveball was also back. It was easy to pick up in high school because SRF would slow his arm when he threw it, but that’s been remedied. It’s at least an average pitch now and possibly his best secondary. The improved command and a third viable pitch round out a scouting reports that still includes a lively fastball in the 92-95 range. His slider is average, in the mid-80s, and he keeps both it and his curveball down in the zone. Scouts want to see the changeup come next, but Reid-Foley’s improved delivery and more consistent arm action are indicators that it may. 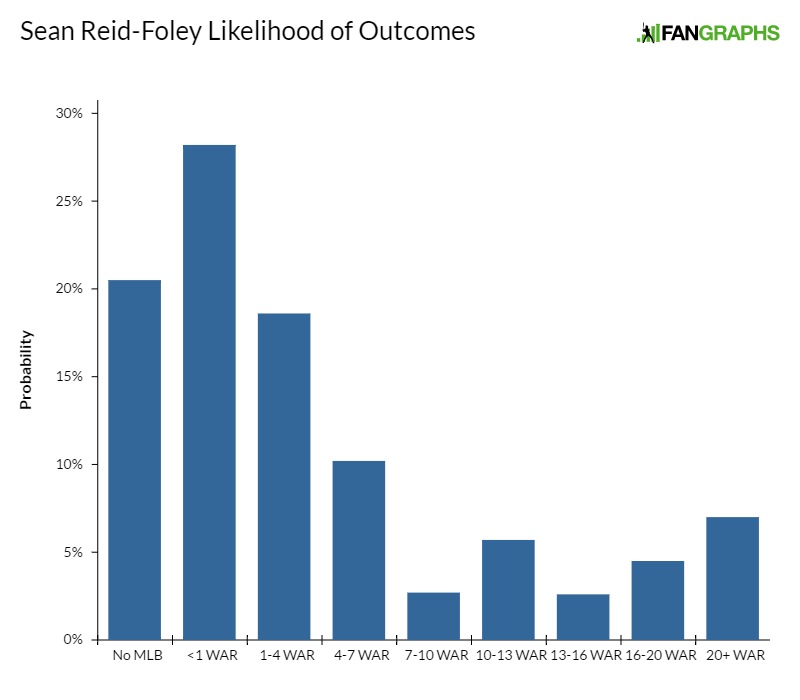 He dealt with elbow trouble late last season, so there’s still some injury risk here, but Reid-Foley is looking like an above-average big-league starter. Slashed .305/.350/.447 at High-A Dunedin in 2016. Urena spent a month at Double-A as a 20-year-old after he hit (including for power) in the pitcher-friendly Florida State League. He has only been switch-hitting for a few years but shows aptitude for contact from both sides of the plate. His swing has more natural loft from the left side (though it’s also a bit longer) and produces more power. 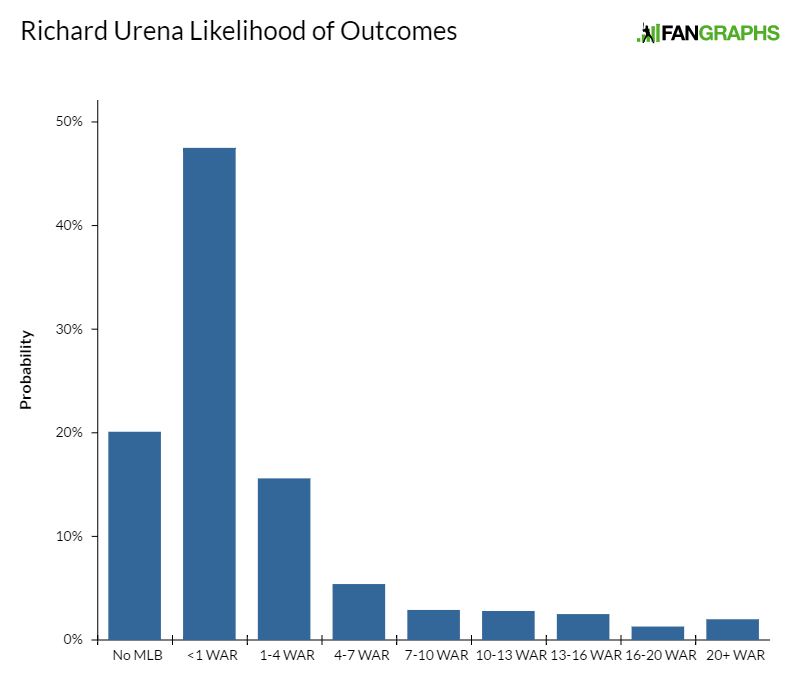 While Urena’s swing-happy approach to hitting limits his ability to walk and reach base, he’s a potential above-average hitter with some doubles power, and that kind of bat plays every day at shortstop if Urena can stay there. He’s not an exceptionally twitchy defender but has good defensive footwork and hands as well as a plus arm. An above-average straight-line runner, Urena has fringey range but should be an average defensive shortstop at peak despite it. I think he could hit around .270 with 30 extra-base hits, most of those doubles. Even with poor on-base skills, that’s probably a fringe to average everyday player. Urena’s a candidate for the midseason top-100 update if he keeps hitting at Double-A. Strikeout rate dropped from 21% to 14% after mid-year promotion to High-A. The top of the 2015 draft was littered with college arms that had some measure of relief risk. Carson Fulmer, Tyler Jay, and Dillon Tate all had some dissenters projecting them in the bullpen, as did Walker Buehler. 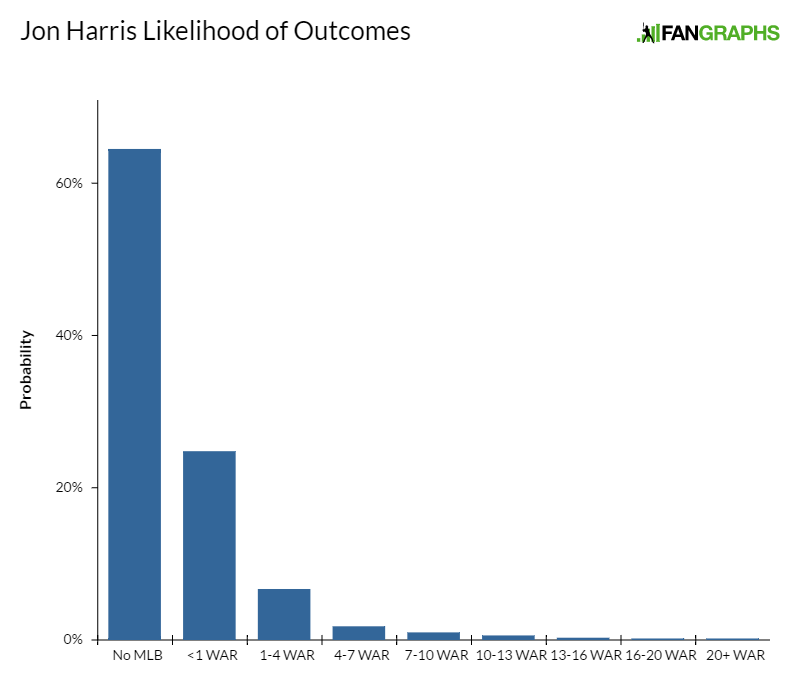 Harris had clear starter ingredients but still lasted until the back of the first round at pick No. 29. Harris has begun to settle in after some mechanical tweaks during his foray into pro ball. He’s mostly 91-94 with the fastball at this point, mostly mixing in a hard, cutterish slider in the mid-80s and a solid-average curveball that he’s been burying in the dirt more consistently in pro ball than he did in college. The curve is his primary weapon against lefties because the changeup is below average, but as long as he’s locating his breaking balls, he really doesn’t need the change. After a full season of healthy starts culminating in a cup of coffee at High-A, Harris seems poised to reach the upper minors in 2017 and could debut late in 2018 if everything breaks right. Without a true plus pitch or surgical command, he’s likely a solid No. 4/5 starter. Recorded 74 strikeouts in 69.2 innings as junior at Pitt. Also made just 10 starts due to groin injury. The highest draft pick in Pitt baseball history, Zeuch body comps to Tyler Glasnow and has similar arm strength, sitting 92-95 and touching 97 with his fastball. Zeuch’s height and high arm slot generate big downhill plane on his fastball and allow him to get on top of an average curveball that flashes above, and projects there. He also has a below-average slider and changeup, the latter of which occasionally shows splitter-like dive. Zeuch is athletic, has a quick arm for such a big guy, and repeats his delivery surprisingly well for someone his size. He should eat innings and projects for average command. The changeup will need to improve, but I’m betting on the arm action and athleticism here, and think it will. Zeuch projects as a solid league-average starter. Gurriel was cleared to sign by MLB last summer but waited until after he turned 23 in October to officially sign with a club, as it exempted him from the international amateur bonus pools. The open-market deal with Toronto (St. Louis was heavily involved, too) was for seven years, $22 million, or just over $3 million in average annual value. That reinforced what I had been hearing from international scouts about Gurriel — namely, that he had some intriguing tools but was likely more of a valuable utility type than a potential star. Scouts see the physical talent to play at second, third, or the corner outfield and one source with whom I spoke thought he’d have a chance of playing center field with reps. His arm is plus and he’s an average runner (above-average underway) with passable defensive actions on the infield. Offensively, it’s been a while since scouts have seen Gurriel in an in-game setting (he didn’t play at all in 2016), and his timing against live pitching has come into question. Timing is going to be especially important for Gurriel, whose swing can get long due to lever length and features more of a ground-ball plane than it does the sort of loft typically associated with corner-worthy power, though he does have good barrel feel. He has above-average raw pop, but scouts are concerned that he might not tap into it due to contact issues and the bat path. Gurriel’s measurables indicate that the body has more to give and that he might grow into more power as he ages, but he’s already 23 and his older brother Yulieski has remained lean into his 30s, so most scouts think the cement on the body is dry. The tool profile here is well rounded but not spectacular, fringe to average hit and game power. If that Gurriel can play all over the field, then that would be quite valuable — and Gurriel did indeed play second, third, short, and left field in 2015, his final year of pro ball in Cuba. Of the 56 games he played that year, 40 of them came in left. When Gurriel signed, it was thought he’d begin his US career at Double-A but, at least until the weather warms up in New Hampshire, he looks ticketed for High-A. As long as he performs, we should see him in the majors this year. He projects as a well-rounded utility man who plays all but the most valuable defensive positions. Tellez destroyed Double-A as a 21-year-old last year, just months after his 2015 Fall League performance was universally panned. Scouts who saw him in the AFL and then again last year say he’s made some adjustments, including a longer stride that has him less rigid and upright than he was the year before. He has big raw power but there’s some concern among scouts about how much of it he’s going to utilize in games. Tellez gets beat by velocity, up. His hands go back high and, sometimes, late, making it hard for him to catch fastballs and make meaningful contact or sometimes any at all. So yes, there are a few visual red flags that have at least given scouts pause about what sort of offensive output Tellez is going to produce in the big leagues — and that he needs to produce as a first-base-only prospect. But he’s got pretty good timing, his feel for airborne opposite-field contact (on the ground, he’s pull-only and is going to be shifted) is solid, he’s shown an ability to take a walk throughout his career, and has the raw power necessary to torch out mistakes. I have a future 50 on the bat and a 55 on the game power, which, as long as he keeps reaching base at his established .350-plus clip, is okay everyday at first base. But while Tellez has hit up through Double-A, there are unquestionably some Quad-A traits here, too, and I know several scouts who think Tellez is going to be solved by big-league pitching. Has posted walk rate in excess of 10% each of last two years. Greene’s 2016 season was split evenly between High- and Double-A before he finished up in the Fall League. He has an electric fastball that was still humming in at 93-97 in the AFL with nasty movement. It’s that type of arm speed that helps generate Greene’s potential plus changeup. Neither his slider nor his curveball is very good, and his stiff delivery and inconsistent release point hurt his control. 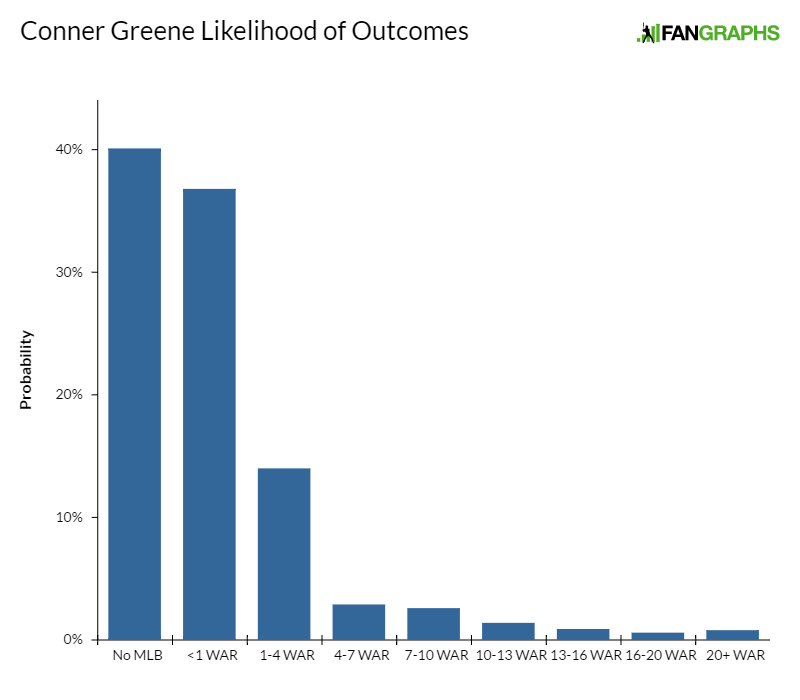 Greene is still just 21, so there’s time for him to improve a breaking ball (I give the slider the best chance to step forward) and his control to become a mid-rotation starter, but there are those who think he’s more likely to be a late-inning weapon out of the ‘pen, and I think it’s starting to look that way. Bichette was part of a fantastic recruiting class at Arizona State (Reggie Lawson, Hunter Bishop, Gavin Lux, Chad McClanahan and others), but nearly all of the big names among them signed with a major-league club. (Only Bishop, of the listed names, did not.) Bichette’s deal was for $1.1 million, about $200K over slot. His pro debut was brief, shortened to just 22 games due to an appendicitis, but he made lots of loud contact during those few weeks and posted an impressive but obviously small sampled 1.100 OPS in the GCL. I was skeptical of Bichette pre-draft. He has exceptional bat speed and above-average raw power, but each time I saw him as an amateur he struggled to keep his eccentric swing under control. I saw lots of ugly swings and misses, and poor contact. He was a star at other events, arguably the best performer at the Metropolitan Classic late in the summer, and there were scouts who didn’t care that his hands were noisier than a Dinosaur Jr. concert and just thought he had great natural hitting ability. Scouts who saw Bichette after he signed noted that his exaggerated leg kick was not always present, a sign that Toronto may actively be working to quiet things down. Bichette is going to begin his pro career at shortstop, but he’s very unlikely to stay there for too long. His footwork is fine for the infield and his body and defensive actions were better as a senior than they were the summer before at Area Codes. He has a shot to stay on the infield either at second or third base, but he’s already a fringe runner with a similar physical build to his father and brother and likely to fill out and slow down as he gets older. I think there’s plenty of raw power for either of those likely defensive spots, but there’s concern about the swing being exposed at upper levels. Posted just 5% walk rate in 2016. El Paso is not an easy locale to scout. It isn’t near anything else or part of an obvious amateur area and often falls under the umbrella of the scouts who cover the Four Corners states. Those scouts, who are usually based in Phoenix, must endure a dusty, joyless, six-hour drive through the Arizona and New Mexico deserts to get there. Maese was a rare reason to do it in 2015, but he was still underscouted because of his location. He was drafted in the third round and signed for an underslot $300K. 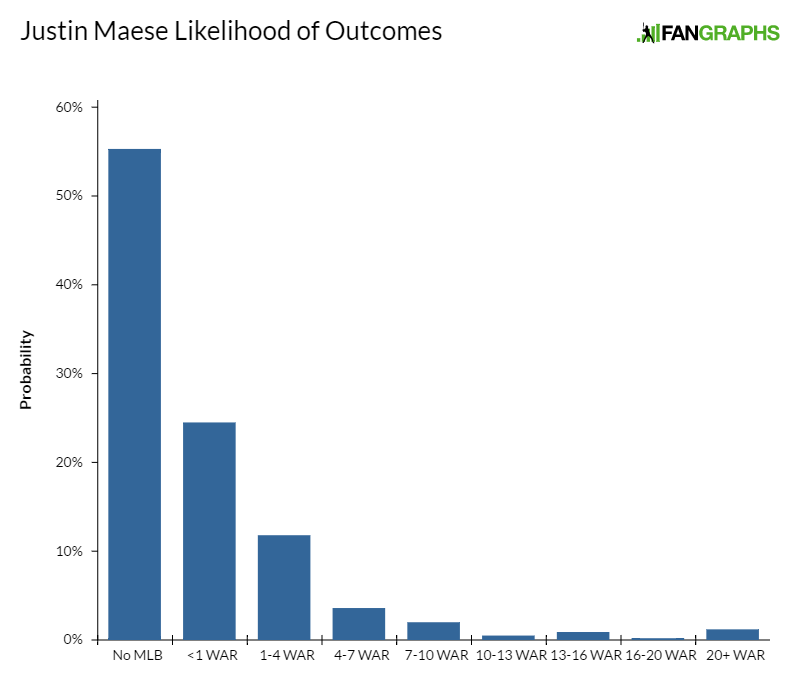 While raw, Maese was (and remains) a good-bodied athlete (he drew some college interest as a QB at Yselta) with a heavy low-90s fastball that will touch 96. Everything he throws is hard. His slider/cutter (which could be plus at peak) will sit in the 89-92 range and Maese’s changeup is firm, often 85-plus mph. It’s a weird repertoire, but Maese is still just 20 and a good athlete. As a result, there’s plenty of reason to believe that he and the Jays can work to add demarcation to his pitches, which might help him miss more bats. 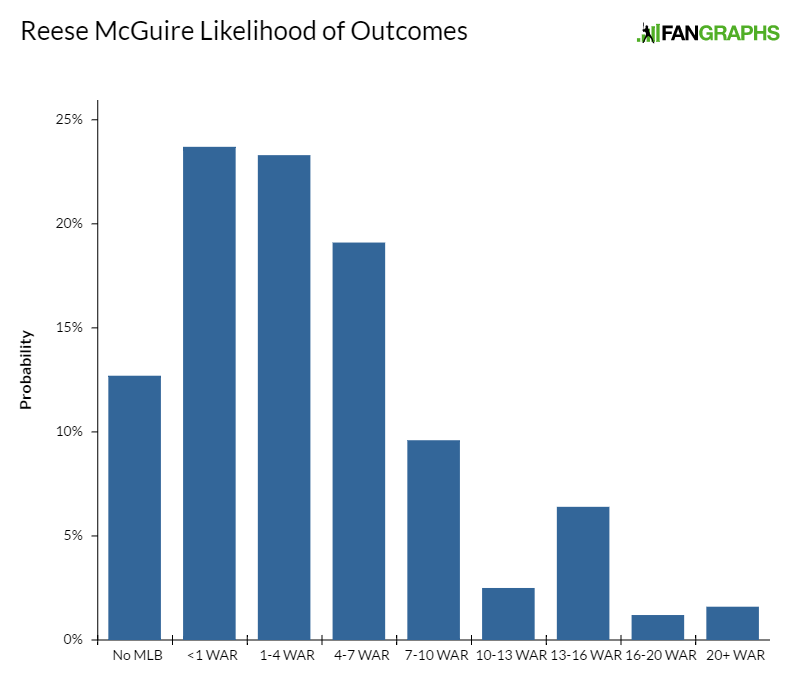 It’s encouraging that Maese has shown an ability to throw lots of strikes despite a sometimes unbalanced delivery, and there’s no strike-throwing relief risk here. His ceiling is going to be dictated by the development of his secondaries, but for now he looks like a sinker-balling back-end starter. Slashed .385/.463/.608 as junior at Auburn. Palacios began the 2016 college season on a tear and was hitting .408, near the top of the SEC, before he injured his wrist while diving for a ball in the outfield in April. He faded down the stretch and lasted until the fourth round of the 2016 draft. He hit well as a pro in the GCL, Northwest, and Midwest Leagues after he signed, but none of those spots had pitching on par with the SEC. As for his tools, Palacios is an above-average runner and was only playing left field at Auburn because D-backs draftee Anfernee Grier was in center field. There are scouts who think he’s a defensive fit in center, and that’s where I have him projected. Palacios has good hand-eye coordination, above-average bat speed, and slashes contact to all fields. He’s aggressive and intense. If Palacios can indeed play center field and hit as much as I expect him to, he has a chance to be an everyday player. If scouts see more of a tweener defensive profile in pro ball, then he’s probably a bench outfielder or platoon option, as there likely won’t be enough power for him to play in a corner. 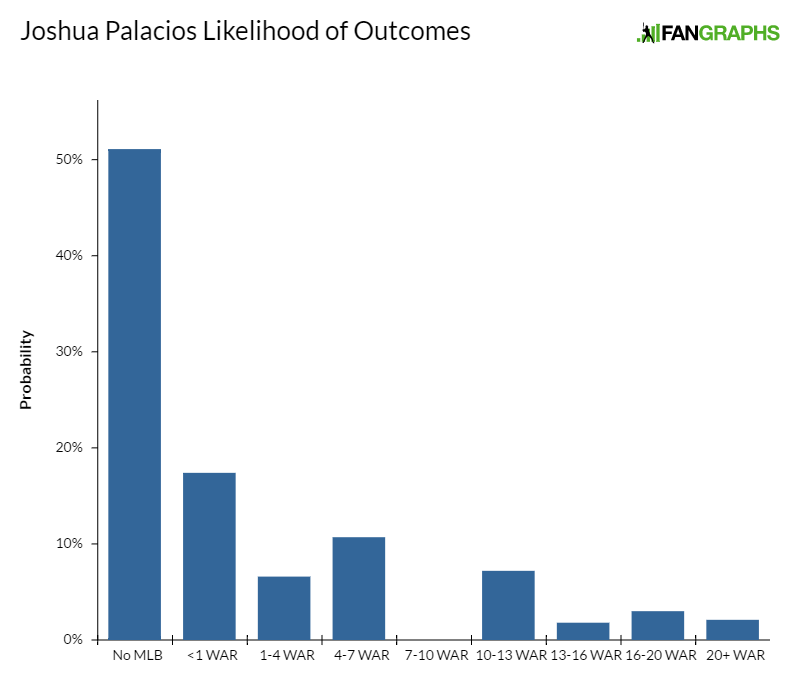 But there were some circumstantial factors that artificially suppressed Palacios’ draft stock last year, and it’s possible Toronto got themselves a steal in round four. Slashed .323/.412/.578 at Ole Miss. Toronto’s 2016 second rounder, Woodman is more tooled up than the typical college outfielder, possessing above-average raw power, speed, and arm strength. His first step in center field isn’t quite enough to project him there long term, but he could be an above-average defender in right field, which is where I have him projected. His swing is stiff and scouts were concerned about swing and miss as Woodman entered his draft year, but he only K’d in 17% of his at-bats as a junior. 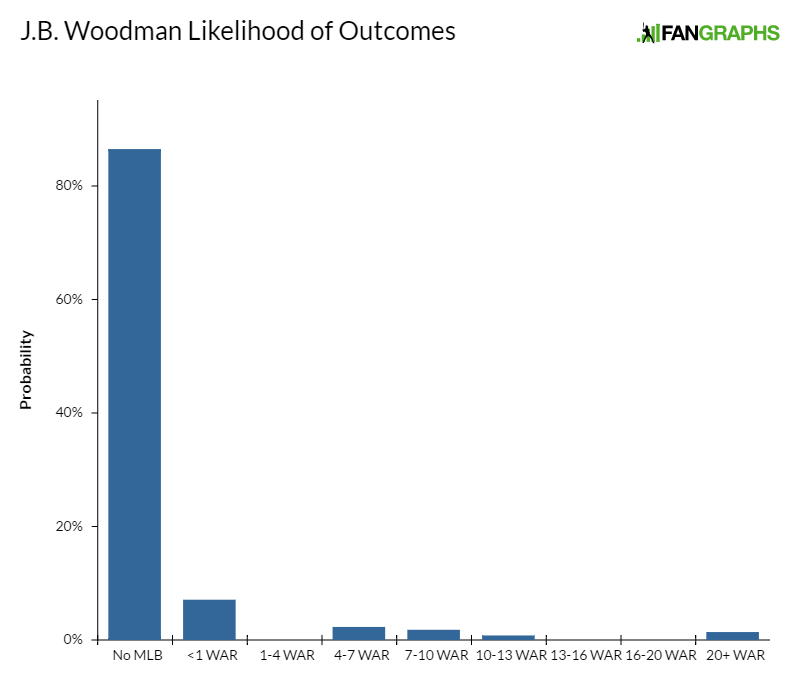 In pro ball, the rate doubled and scouts who saw Woodman in the Northwest League were not enamored of his ability to make contact despite his good-looking numbers. Power/speed/arm strength with strikeouts is a traditional right-field profile, and that’s what Toronto seems to have in Woodman. I have him behind Palacios (who was drafted two rounds later) because I think Palacios has a better chance to retain his speed as he ages and a better chance to hit, which stabilizes his profile. But if you wanted to flip them on the logic that, if he hits and gets to his power, Woodman has more upside, I wouldn’t argue with you. Has produced just .332 career slugging percentage in pro ball. McGuire was drafted in the middle of the 2013 first round because he was one of the more polished and promising defensive prep catchers of the decade. He was an advanced receiver and ball-blocker with a plus arm and quick release. As McGuire has filled out some of twitch has gone away, and his arm plays closer to average now while he’s still a good defender. He hasn’t developed offensively, has below-average bat speed and power, and pounds the ball into the ground, so his future is likely that of a glove-first backup. Basically none, as he’s only played 99 career minor-league games due to injury, but he hit .314 at Low-A in 62 games last year. Pentecost was a uniquely decorated and tooled-up college catching prospect. He won Cape League MVP in 2013, hit .422 the following spring (second in the country), was posting plus run times, and carried Kennesaw State to regionals. Scouts thought he had a chance to catch, become a plus hitter, and provide some value on the bases. He was drafted 11th overall in 2014. And then came two labrum surgeries. Pentecost didn’t play at all in 2015 and then, when he finally returned midway through 2016, he did so as a designated hitter while still doing some catching drills on the side. He’s 24 and has only played 12 games above Low-A, but the physical hitting tools appeared to be intact in 2016 and he’s kept himself in great shape despite having barely played for parts of three pro seasons. 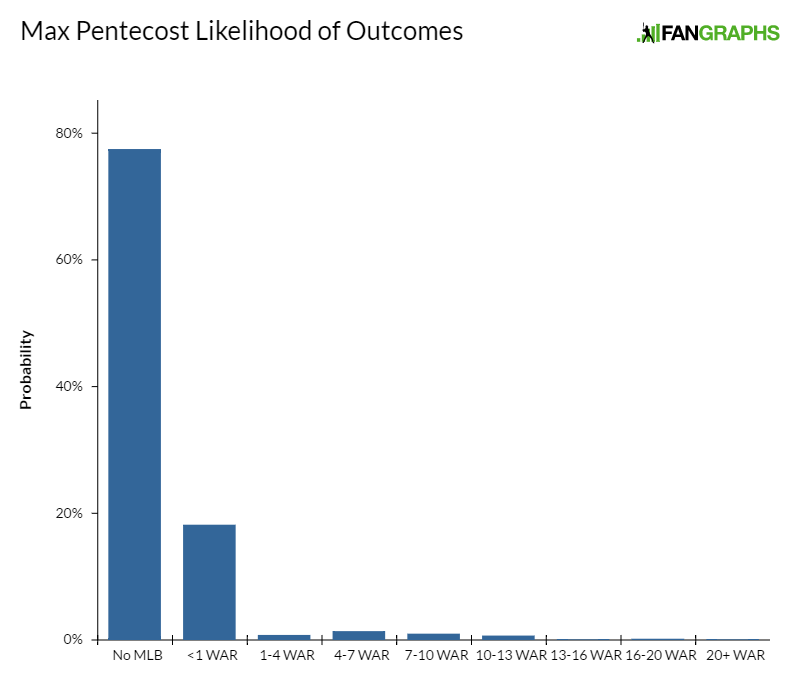 Obviously, Pentecost’s defensive situation is dependent on how well he can throw after the shoulder surgeries. It was average in college, arguably playing up due to Pentecost’s quick release. He has taken ground balls at first base this spring and has the speed to play in the outfield, too. If/when a full-time move occurs, more pressure will be put on Pentecost’s ability to hit for game power, something he’s shown only a modest ability to do in pro ball. Allowed 40 walks in 53 innings at Arkansas. Jackson was in and out of the Arkansas rotation as a junior. He has starter stuff (there’s a viable, third-pitch changeup) but neither a starter’s delivery nor command. Amateur scouts didn’t think Jackson could efficiently throw strikes for five-plus innings. He was 91-96 last year with deceptive funk and an above-average, Lidge-ish slider. (It’s not that nasty, but it is that hard and features purely vertical drop.) He could move quickly as a potential set-up arm as long as he’s not constantly spiking fastballs. Ramirez has well below-average game power despite a thick, stocky frame and likely left-field-only defensive profile due to several lower body-injuries — including a season-ending knee issue after he was traded from Pittsburgh to Toronto mid-year. He reported to camp out of shape in 2015, and his body’s rapid maturation had already begun to slow him down and make him less viable in center. He has average bat speed that plays down because of the length in the back of his swing, and he lives off of excellent bat control and hand-eye coordination. Kevin Vicuna, SS, 0.1 KATOH+ WAR – Vicuna is a good defensive shortstop prospect with enough range, arm, and actions not just to stay at the position but potentially be plus there. He’s very skinny and needs to add weight if he’s going to do anything at all with the bat, but the glove is very promising and the org thought enough of him to throw him into an early big-league game this spring at age 19. I think he’ll be the system’s big riser in 2017. Ryan Borucki, LHP, 0.9 KATOH+ – For a pitcher who has missed so much time with injury, Borucki is surprisingly adept at changing hitters’ eye level with a fringey fastball and potential plus changeup. Borucki had TJ late in 2012 (he signed one of several overslot, post-10th-round deals on this list) and missed all of 2013, then had shoulder and elbow problems again in 2015. He sits 87-90, throws strikes, and has an above-average changeup. His slider is fringey and the velo and braking ball limit his upside. He could be a back-end changeup/control starter, but there’s significant risk here because of the injury history. Jonathan Davis, OF, 0.6 KATOH+ – Davis hit 14 homers, 21 doubles, 8 triples, stole 33 bases, and reached base at a .376 clip at Dunedin last year. He was 24 and had never exhibited that kind of production before, though he had also never been healthy. Davis has been on the DL nearly half-a-dozen times over the last three years, and his size (5-foot-8) compounds fears about his durability. Davis is a plus runner and track pitches fairly well. He has fringey bat speed but has feel for hitting the ball the opposite way when he’s late. He could be a late-blooming bench outfielder, but if he keeps performing like he did last year in the upper minors it’s time to re-evaluate. Joseph Reyes, 3B – Reyes was the club’s top 2016 J2 signee. He was inked for $300K, the largest bonus Toronto was allowed to give after exceeding their pool amount in 2015. Reyes has plus bat speed and an ability to golf out pitches down and in. He’s a physical kid and I think there’s power potential here, but Reyes is not so big that first base or an outfield corner is a foregone conclusion. Osman Gutierrez, RHP, 1.0 KATOH+ — After spending four years in complex-level ball, Gutierrez, who signed out of Nicaragua in 2011, finally got to an affiliate in 2016. He’s big (6-foot-4, 220), throws hard (91-95), and has a long arm action. Gutierrez has a short, average slider in the 82-86 range and a fringey changeup in a similar velocity band. He projects as a fifth starter or long reliever. Danny Barnes, RHP, 2.7 KATOH+ – Barnes was a 35th-round pick in 2010 out of Princeton (a team with two big leaguers in Barnes and Matt Bowman) and debuted last year. He’s 27, but his riding low-90s fastball and command of a cutter suggest he could play an up-and-down relief role. Patrick Murphy, RHP – Murphy hails from Hamilton High in Arizona, which has been in the news for several reasons recently (their high-school baseball team is at NHSI and the football team is in the midst of a hazing scandal). Murphy didn’t pitch there as a senior because he was recovering from Tommy John. He signed an underslot deal in the third round. Nerve issues continued to plague him, and he threw just four pro innings from 2013 through 2015. He came back last year, though, touching 95 and showing some curveball feel. He’s only 21 and there’s still time to develop Murphy as a starter, if that’s what Toronto wants. It might behoove them, however, to move him quickly as a reliever before something else happens. Francisco Rios, RHP, 1.8 KATOH+ – Rios carved up the Midwest League with his above-average curveball early in 2016 and then faced a more difficult challenge in the Florida State League, where he didn’t miss as many bats. His stuff was less crisp late in the year. Rios is a stocky 6-foot-1 and relatively unprojectable. He sits 89-92 and, beyond the curveball, the rest of his repertoire is fringey. He throws strikes, though, and sequences well. He has a chance to be a No. 5 starter. He’s 21 and was signed out of Mexico in 2012. Yennsy Diaz, RHP, 0.7 KATOH+ – An undersized arm-strength lottery ticket, Diaz’s delivery needs considerable polish if he’s to start throwing more strikes and improve the consistency of his curveball, his best chance at missing bats with a secondary offering. He throws hard, sitting 89-95 with varied amounts of sink. If the command and curveball can be polished up, he could be a solid bullpen piece. Reggie Pruitt, CF – Pruitt got $500K in the 24th round of the 2015 draft to keep him away from a commitment to Vanderbilt. He’s a 70 runner with a slight frame, very little power, and is likely a fourth-outfield prospect because of the lack of damage he does with the bat. If he develops into an elite defensive center fielder he could play every day as someone’s eight- or nine-hole hitter. Travis Hosterman, LHP – Hosterman got $400K to sign as an 11th-round pick in 2016. He has a reasonably projectable frame and may add to his currently below-average fastball. He’s shown advanced changeup feel and some ability to get on top of a breaking ball from his high arm slot, as well as surprising fastball command from a delivery that has some head violence. He’s a high-risk back-end starting-pitching prospect. Angel Perdomo, LHP, 2.6 KATOH+ – A gigantic 6-foot-6 lefty composed mostly of limbs, Perdomo sits 87-93 with deception but a predictably inconsistent delivery. He’s a fringe athlete and, on the verge of his 23rd birthday, the sun is beginning to set on scouts’ optimism that Perdomo will be able to develop not just average command but average secondaries, as well. Both his slider and changeup are still below average. If one of them steps forward, he might make for an interesting relief piece — especially if his fastball plays up in shorter bursts. Guerrero’s name hasn’t been invoked in these pages for a couple years, not since he was included in Kiley McDaniel’s own contribution to these organizational prospect lists back in March of 2015. At the time, McDaniel noted that Guerrero both (a) was currently a shortstop and (b) was unlikely to remain a shortstop. In a rare development, McDaniel turns out to have been correct on both accounts. 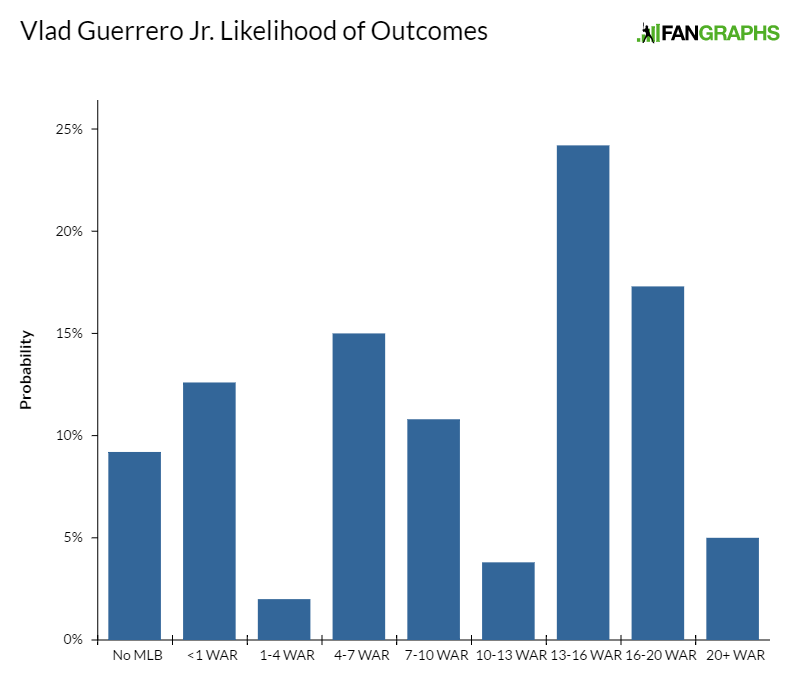 In roughly equal stints at High- and Double-A this past season, Guerrero recorded multiple starts at first base, third base, and right field, although third was the position at which he most often appeared. According to the available metrics, Guerrero was a defensive success in 2016, recording positive fielding-run marks as a third baseman at both his minor-league levels according to Clay Davenport’s methodology. As a batter, meanwhile, Guerrero represents a departure from most of the players designated as Cistulli’s Guys in this series: while this space is typically occupied by diminutive, contact-heavy types, Guerrero hasn’t exhibited particularly notable bat-to-ball skills. He’s also not diminutive: even in 2015, McDaniel suspected that Guerrero was larger than the 6-foot-4 and 190 pounds at which he’s listed. A couple years later, that’s almost certainly the case. The physicality has translated to power on contact. His .253 isolated-power mark was the second-highest such figure among Florida State League batters who recorded 150 plate appearances or more. His .181 ISO with New Hampshire, meanwhile, placed him in the 86th percentile among Eastern League hitters with 150-plus plate appearances. This system is the equivalent of the No. 1 through No. 4 seeds all reaching the Sweet 16 in a given NCAA tournament regional. The top of the system is entirely stocked with early-round picks and high-profile signings but possesses no pop-up prospects or late-round interlopers to speak of. Vanilla though it may be, it’s not a bad system and is sturdy enough to withstand an efflux of talent should the big club require another piece or two by mid-summer. The team has mostly hunted college pitching in the draft for the last five to eight years but is under new management now. It’s too early to identify any patterns in the farm system that might tell us what kind of players Ross Atkins likes to chase. It’s likely that the days of Toronto drafting very aggressively, even if a prospect’s signability is in question — as it was with Tyler Beede, Phil Bickford, Kevin Comer, and others — are over. As far as future acquisitions are concerned, the club has two top-30 picks in June’s draft and might be able to get somewhat creative if a high-end prospect falls that far, which could complicate things for teams like Tampa Bay, Minnesota and Cincinnati, who are all in position to try to move big prep talents back to their second picks. I’ve also heard the team mentioned as a potential suitor for Brazilian righty Eric Pardinho, who will be eligible to sign with a club in July. We hoped you liked reading Top 17 Prospects: Toronto Blue Jays by Eric Longenhagen! So I take it you like Luis Robert a lot more than Lourdes?